INDEPENDENTS 4 CHANGE TD Joan Collins has said “it will be a real exposé” of Fianna Fáil if it does not support a bill to hold a referendum to ensure that water services remain in public ownership. The government shall be collectively responsible for the protection, management and maintenance of the public water system. The government shall ensure in the public interest that this resource remains in public ownership and management. It is supported by 39 TDs so far, including Sinn Féin, AAA/PBP and independents, as well as the Right2Water campaign and affiliated trade unions. Independent Alliance TD and Minister of State for Disabilities Finian McGrath said earlier this year that a referendum on public ownership of water is required to rule out any move towards privatisation. Collins is now urging Fianna Fáil to back the bill, making the point that the question of who should own Ireland’s water falls outside the terms of reference for the expert commission, which featured in the Fine Gael and Fianna Fáil confidence and supply agreement. The issue of public ownership was supported by Fianna Fáil during the recent election, she added. Speaking to TheJournal.ie, she said, “if Fianna Fáil don’t support it, it certainly will be a huge retrograde step from their point of view… there is no reason why they shouldn’t support it”. Fianna Fáil’s housing spokesperson, Barry Cowen told TheJournal.ie that his party are “not adverse” to the proposal. He said party members plan to look at the bill in more detail with a view to discussing it further at their parliamentary party meeting on Tuesday. “We can see the merit in it and understand the sentiment of it,” he added. He said legal opinions will have to be consulted as to whether it is a runner, but said stronger legislation might be the way forward in relation to safeguarding the public ownership of Ireland’s water supply. Cowen said the bill does not impact on the confidence and supply agreement as it commits to strengthening public ownership. Collins said ensuring that public ownership of the water infrastructure is engrained in the Constitution will reassure the public. “They [the public] don’t trust this government,” she added. Collins explained that there are two aspects in the water charges movement – the issue of payment and the issue of ownership. 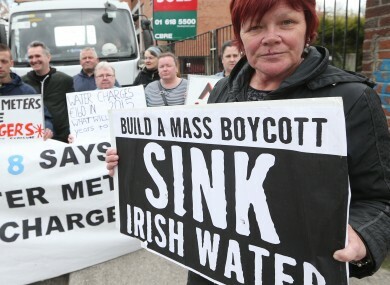 “To get this in the Constitution will close this down… water is the new gold, we have to protect it,” said the Dublin South Central TD. Unlike other motions tabled in relation to water services, this bill could have an impact, she explained. “This bill can make a difference if passed… It will pass if Fianna Fáil back it,” she said. Email “'There's a real chance of a referendum on the ownership of water, but we need FF to back it'”. Feedback on “'There's a real chance of a referendum on the ownership of water, but we need FF to back it'”.